I have finished the Friendship Galaxy baby quilt top! I love the abundance of stars! 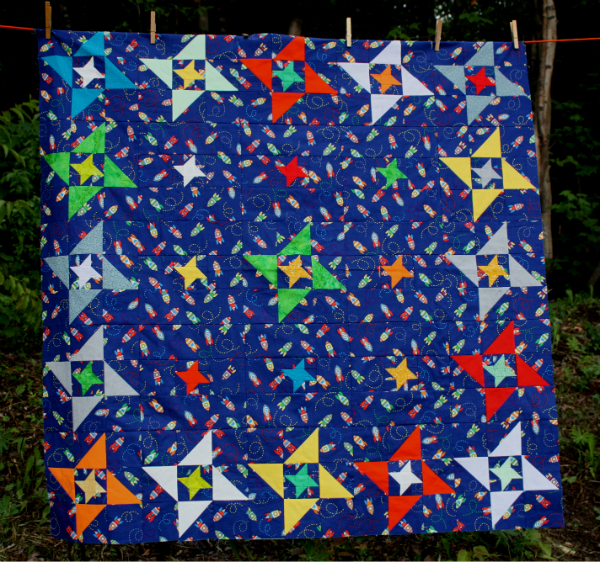 I made the stars with a mix of solids, prints and batiks, all in colours to coordinate with the rocket ships in the background fabric from Connecting Threads. I've already started quilting with stippling and stars (more stars! ), and I hope to have it finished quickly. The baby is due in about 2 weeks, after all! The pattern is also finished and just needs a final read-through before I send it to the quilters who have so generously offered to test it for me. I can't wait to see their versions of Friendship Galaxy! Wow...it looks great. Saw a bit of your quilting earlier. It's going to be awesome when it's finished. Such a fun quilt! Beautifully done! Great baby quilt! The stars just shine with the background fabric. Such fun. Leanne that is so cute! 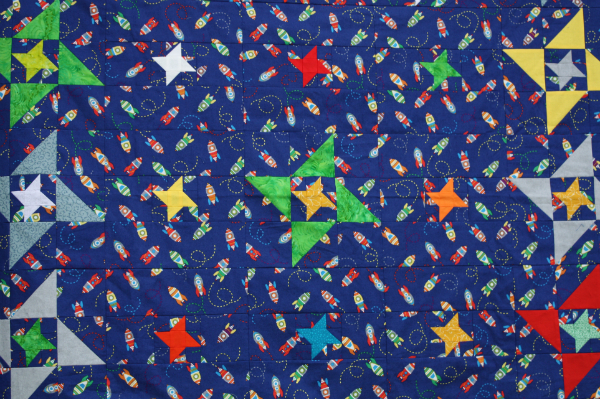 I love how the stars looks twinkly and the background fabric with little rockets zooming around is so fun! I would have loved this as a child - the colours are perfec and the rocket ship fabric really brilliant for a baby quilt! A great baby quilt. Love how bright and cheerful it is. It looks great, and I love those cute rocket ships!! Oh I love the rocket ship and stars. I wish I had a little one to make a quilt like this for. Mom and baby are sure to love this quilt. It isSo bright and happy!